Living and studying in another country is a big challenge and the experience of a lifetime. SCNU recognizes that international students need extra support to make the transition to university life in China. CIC, SCNU's International Student Services provides valuable help and support for all international student needs including orientation, and accommodation. We offer free airport collection for students to come to study at CIC, SCNU. Students who enroll with CIC, SCNU should inform the International Office of their flight number, arrival time, and arrival date at least 7 days before their journey. The free airport collection service is available only on some days before the beginning of each semester. For those who fail to arrive at our university on specified days, please follow the instruction on ��How to get to SCNU' provided in previous chapters to come to our university. For anything particular, please contact International Office of CIC, SCNU for assistance (Tel: 0086-20-85210012 from outside China, 85210012 if you are in Guangzhou already.). International students are not allowed to work during their study. If a couple comes to study at our university together, upon presentation of valid certificate or other proof, one spouse can enjoy 50% off of the tuition fee of one semester. This policy continues to be valid until one spouse or both leave our university.This policy applies to students who are doing a non-degree study at SCNU only. Studying abroad is about much more than just gaining an education. It's also about experiencing a different culture and having a good time in the process. CIC,SCNU offers numerous social and recreation activities and services. Smart Phone: A good packages is available for use: ��PAY AS YOU GO�� which is named here as ��HUA XIA FENG', RMB 0.2 yuan per minute for a local call and dial 17909+area code + number is also RMB 0.2 yuan per minute for a long distance call within China. Telephone card ��200', ��201': This card is especially good and valuable for international students to make an international call to their home or friends outside China. For details please enquire at the Home office of the college. Mobiles: Two mobile network service providers in China are China Mobile and China Unicom. Many packages are available, you are welcome to inquiry on this at the Home Office. How to get to be university SCNU is a very convenient place to reach no matter what means to take, by air, by train, or by bus. From the Guangzhou Baiyun International Airport, you can take Airport Bus to GUANGYUN LOU which is the terminal of one of the airport coach routes and is the closest one to SCNU. The coach ticket is round RMB 22 yuan. 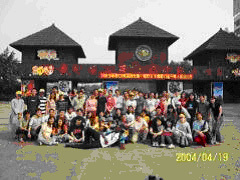 From GUANGYUN LOU you can then take a taxi which is likely to cost you around RMB 15 yuan to get to the inside of SCNU. Remember to go to COLLEGE OF INTERNATIONAL CULTURE. Don't forget the telephone number 85210012 as you might need it if you find yourself lost on campus. 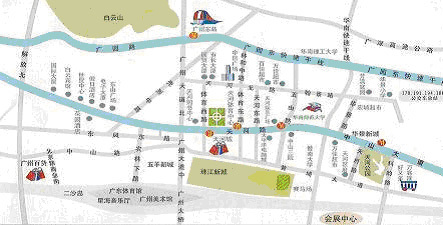 It is around 10 minutes from East railway station (Named GUANGZHOU DONG ZHAN in Chinese) to SCNU by taxi. From the old train station (named GUANGZHOU HUOCHE ZHAN, or simply GUANGZHOU ZHAN) you can take buses No. 269, 234, or 33 to arrive at the university. Many buses stop before the main gate of the university, such as 178, 248, 515, 242,296,and so on. The ticket fare for normal bus is RMB 1 yuan, RMB 2 yuan for air-conditioned one. On campus there are shops and open markets in SCNU and almost all the necessities for everyday life are available. Off campus nearby there are also several big supermarkets or large stores for a specific trade of commodities. SCNU enjoys a multi-functional library that holds around 2 million hard copies, of which 1,690,000 are in Chinese and 240,000 are from foreign sources, and 3000 periodicals, from both internal and external sources. Various types of databases are over 40. Internet service is available to all. There are 4 canteens on campus, located in different places of campus. A variety of foods are offered at low, mediate and high levels of price. One western food restaurant is on the second floor of ��QIN YUAN'. An open market is also within walking distance on campus if you like cooking yourself. University clinic is available on campus. Nearby the university within walking distance there is the 3rd Affiliated Hospital to Zhongshan University, one of the locally well-known hospitals. A Construction bank of China is on campus, in which both Chinese RMB and some of the main foreign currencies can be processed. Near the main gate and west gate of SCNU you can also enjoy the services of Commercial and Industrial Bank of China. A mini post office is on campus that provides great convenience for the students. There are two standard sports playground on campus, and gym, basketball playground, tennis ball court, badminton hall, and swimming pool as well. As to the prices and other details of the facilities, please go to Home Office of the college. For an international student living on campus of SCNU, it is not expensive. Generally speaking the living expenditure of one student, excluding accommodation, is around RMB 500 Yuan, including meals, phone calls, and traffics, which means around RMB 6, 000 a year. Of course things are quite different if you are living off campus, which may vary greatly from person to person. 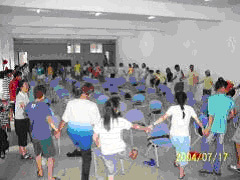 The accommodation fee normally is around RMB 700 �C 2,000 Yuan a month. The prices vary in terms of furniture and facilities, distance from university, environment, etc.